This is a completely restored 1930 Wheeler wooden boat. (wooden hull with fiberglass coating). It has teak decks, mahogany & oak interior. All wood work was hand made. Has a kitchen (electric stove, microwave & mini fridge). Bathroom with full shower & sink. 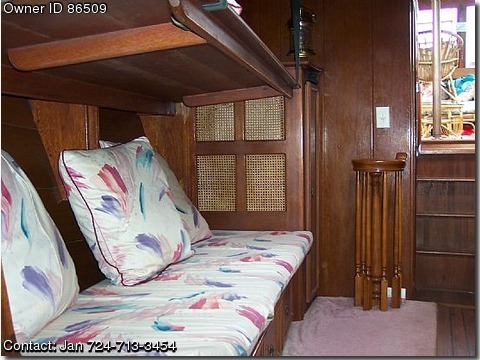 Dining area; can sleep 6-8 in forward cabin; captain's quarters are seperate. Has a Kohler generator; air compressor; a/c & heating system. Can hold approx. 300-400 gallons of fuel & fresh water. Boat has been dry-docked and trailer stored since Oct. 2006. Needs a little t.l.c. to get back in the water. Comes with a steel multi-axle trailer. This is a very nice, one of a kind, antique wooden boat. I'm hoping to find a really good home for her.. Please contact Jan @ 724-713-3454/holmjje@yahoo.com for more information.